The 1804 Capped Bust Large Eagle $10 Eagle was subjected to heavy melting by bullion speculators. The $10 Capped Bust theme switched from a small eagle reverse to a large (often called Heraldic) eagle in 1797. This was in response to criticism of the sickly appearance of the small eagle. In the minds of many, the smaller bird projected an image of weakness for the newly organized nation of the United States. The Capped Bust (Large Eagle) $10 Eagle was minted until 1804. It was discontinued because at that time, most United States gold coins never made it to circulation because bullion speculators were exporting them to Europe for meltdown and profit just as fast as the Mint could produce them. United States $10 gold eagles were not coined again until 1838, making the 1804 edition the last date of this denomination for many years. Of the estimated 3,757 struck, fewer than 100 exist today. As is the case with most early United States gold coins, the 1804 Capped Bust Eagle is immensely popular. Genuine examples of this classic rarity are highly coveted by advanced collectors, as evidenced by utterly spectacular price advancements over time. There is no reason to doubt this remains the long term outlook for this remarkable coin. The 1804 Capped Bust $10 Eagle has a remarkable record of price increases. 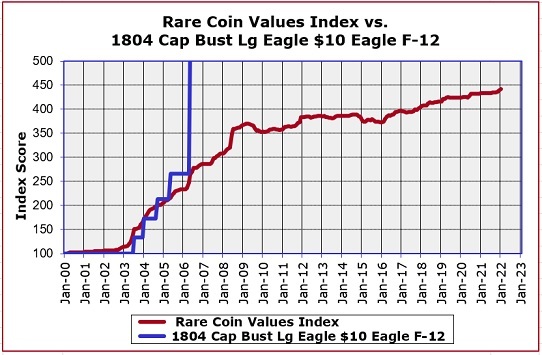 The blue line above charts the percent value increase since Year 2000 of the 1804 Capped Bust Eagle in F-12 condition. The line goes completely off the chart, meaning it multiplied in value by at least five times. By comparison, the Rare Coin Values Index, as graphed by the red line, has increased in value "only" about 3.5 times over the same time period. The Index is the composite percent change since Year 2000 of a cross-sectional group of 87 rare US coins. The objective of the Index is to approximate the strength and direction of the overall rare US rare coin market. The 1804 Capped Bust Eagle is one of the 87 coins that comprise the Index. All Index data is updated monthly.